Triathletes with some fitness and race experience may decide against a warm-up. The main difference between these triathletes and the beginners is that the race intensity tends to be higher during the last half of each event and for the overall race. Some of these experienced triathletes will prefer a very short warm-up of 5 to 10 minutes of easy bike spinning to check the gears, followed by a run of 2 to 5 minutes. These athletes may or may not include a short 100-meter warm-up swim. Because the advanced triathlete’s race is fast from the start, a prerace warm-up routine is necessary. These athletes may ride the bike for 20 to 30 minutes before the start on race day. They will likely also do a run of 10 to 15 minutes. In both the bike and run warm-ups, a few race-pace efforts should be included. These efforts are typically 60 seconds or less in length and include generous recovery times of at least 2 to 3 minutes. A swim warm-up is also part of the race-day routine. Swimming 300 to 500 meters is not uncommon. A few 25-meter segments at race pace should be included in the warm-up. If swimming is not an option for warm-up, swim cords can be used. A negative-split tactic is the best way to enjoy a successful sprint event for newer triathletes. Plan to begin the race at a pace that seems too easy. Triathletes should plan to finish the race at the fastest pace practiced in training or slightly faster. Experienced triathletes’ race-day speeds should be similar to the speeds used in training. Because the experienced triathlete had some 4 to 8 weeks that included threshold work, a good portion of the race can be done at threshold intensity. Triathletes still green at racing should aim for a negative-split pace in each discipline. They should begin each discipline in zone 1 or 2 and push to zones 3 to 5a at the halfway point. As soon as the gun goes off, faster triathletes are hitting zone 4 to 5a pace. Advanced triathletes use discretionary zone 5b and perhaps zone 5c. These anaerobic efforts are used tactically to advance overall race placement. In the swim these efforts are used to drop drafting competitors or bridge a gap to the feet of a competitor for purposes of drafting. A negative-split strategy may be used by beginning the first half of each discipline at zone 4 and performing the second half of each discipline at zone 5b pace as much as possible. Although the triathlete may have a prerace strategy to perform a negative-split race, the competition may demand the use of higher race paces at times not favored by the triathlete. The best triathletes will be ready and willing to wield fitness at any time, regardless of time or location within the event. In the most hotly contested races, triathletes must be ready for a final kick sprint to the finish line. The most competitive athletes, with the best competition, will need to train for this final kick. In sprint-distance racing, fast transitions are more important than they are at longer distances. Races can be easily won or lost in the transitions. When exiting the swim, running to the first transition (T1) is necessary. If the run to T1 is long or hilly, this element needs to be included in training. Transition setup before the race has cycling shoes attached to the pedals. The shoes and pedals are held parallel to the ground by attaching lightweight rubber bands to the shoes and securing the shoes to the frame. This setup keeps shoes from wildly rotating while athletes run out of transition. Rotating shoes can catch on the ground, jamming and causing the shoe to release from the pedal. Obviously, stopping to retrieve a lost shoe is a time waster. The fastest triathletes use a flying mount, similar to those used in cyclo-cross, to jump onto the bike and begin pedaling with their feet on top of the shoes. The light rubber bands break away. The feet can then be slipped into the shoes when the triathlete has settled into a comfortable pace. Notice that socks are not mentioned. Fast transitions for short races do not allow the use of socks. This topic will be further discussed in chapter 33. As in T1, the fastest triathletes perform a flying dismount before reaching the dismount line for the second transition (T2). To be ready to dismount, triathletes remove their feet from the cycling shoes and pedal with their feet on top of the shoes for the last 100 to 200 meters. At the dismount line, these triathletes hit the pavement running. Slipping into running shoes sans socks, they head out on the run course. The fastest and most fit triathletes are capable of running the entire 5K in zones 5a and 5b. Those with less fitness are better off beginning the run in zone 3 or 4 and doing a negative-split effort by doing the last half of the run in zone 5b. In a perfect world, the weather on race day would be not too hot, not too cold, but just right. But because our world isn’t perfect, triathletes need to be prepared for weather extremes. Although race directors often cancel or modify a race if weather is extreme, the decision of whether or not to race remains with the individual triathlete. If a triathlete expects to race in hot and humid conditions on race day, doing some acclimatization is wise. A rule of thumb is that 10 to 14 days are needed to acclimatize to hot conditions. If triathletes can conduct training in a hot environment, doing an aerobic workout in the heat is wiser than doing a track workout. In all cases, triathletes should expect pace to decrease in any hot conditions, even after acclimatization. If a triathlete lives in a cool location but is preparing for a hot race, wearing extra clothing for workouts to stimulate sweating is a proven tactic. But triathletes should not wear rubber sweat suits or other clothing that is not breathable. Early spring and late fall races may be downright cold. Sipping on a hot beverage from a thermos before the swim can help triathletes keep warm at the start line and through a sprint race. If a triathlete gets cold easily, slipping on a jacket for the bike ride is worth the extra time. If the triathlete is racing at altitude but lives at sea level, arriving at altitude 45 hours or more before the race will help performance in endurance events, according to at least one researcher. This excerpt is from the book, Triathlon Science. It’s published with permission of Human Kinetics. 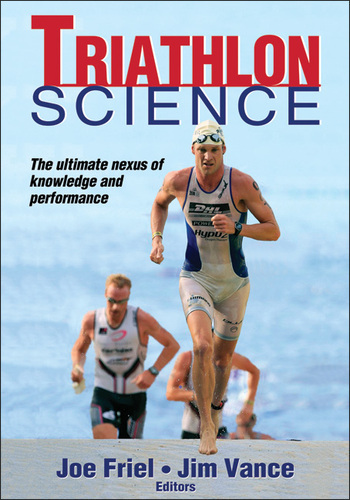 Purchase this book from Human Kinetics and help keep MyTriathlonTraining.com online.